We’re at the Windows Phone Summit in San Francisco today, listening as Microsoft tells us about what’s next for the future of WP devices. One of the parts that the company has focused on is that of consumer-facing features, and we wanted to fill you in on what we know. While Microsoft purposely didn’t disclose all of the features, we did get a taste of a few. Windows Phone Program Manager Joe Belfiore came to the stage, talking a bit about where Windows Phone came from, and where it’s going. First and foremost, Windows Phone 8 and Windows 8 will have a “shared Windows core”. Its heritage in rooted within the Windows kernel, which is in use across the world. For consumers, “this new shared core is going to mean a much greater choice in hardware”. Belfiore says that it “scales up and scales down” which will provide a wider array of devices and price points. Though it’s a more developer-centric feature, it’s important to note that this shared core will allow for a single driver to work across all Windows 8 devices, including Windows Phone. No longer will you have to find tablet drivers, then another for your desktop. Screen resolutions are going to be more variable, as well, as opposed to the singular resolution of Windows Phone 7. Standard 720p and WXGA “720p+” will both be supported. Removable MicroSD support is coming to Windows Phone and phone to PC transfer will be available. 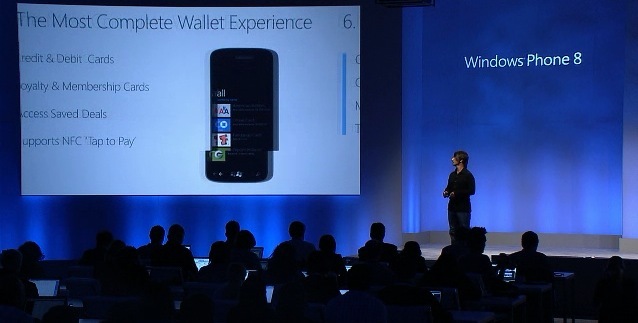 NFC is coming to Windows Phone, which ties in with “what we think will be the most complete wallet experience on any smartphone this fall”. Belfiore says that Wallet Hub hopes to replace the physical wallet to save loyalty, membership, credit/debit cards, as well as coupons. Secure NFC payments will also be supported, so that you can scan the phone to make payments. France’s Orange will be the first to market with secure SIMs, with the US market to follow, working directly with the Isis payment platform. Nokia Maps comes to Windows Phone as part of the partnership between the two companies. The data, of course, is still provded by Navteq, and includes the ability to access maps while offline. Turn by turn directions are also included. New start screens come to Windows Phone, with a familiar layout but allowing much more customization for the entire Live Tile setup. You can read more details about that in our post here. Unfortunately, it appears that’s all we’re getting for today. Stick with TNW Microsoft to find all all of the Windows 8 and Windows Phone 8 as they happen.